This past week, we’ve been supporting our clients at the Mobile World Congress (MWC) in Barcelona – and what a week it’s been! Everyone from manufacturers and suppliers, to journalists and influencers have experienced some of the most innovative, exciting technologies and had a glimpse into the what the future might look like for mobile. At last year's MWC, 5G was still a work in progress. Now, it feels like not only is it coming, but it’s coming fast. EE is set to roll out 5G within 16 UK cities later this year across London, Cardiff, Edinburgh, Belfast, Birmingham and Manchester as phase one of launch, so we could be able to experience the super-fast 5G speeds as soon as this summer. At MWC this year, most manufacturers announced a 5G device, including major manufacturers such as Samsung, Nokia, Huawei, Xiaomi and LG to name a few. If not, almost all manufacturers showcased a 5G logo at the very least to acknowledge their 5G plans in the pipeline, even if their concept has not been made official yet. It's clear to see why 5G will be the next big thing – the handset makers will gain as there’ll be a higher consumer demand for devices with 5G capabilities. But 5G is much more than just phones. It will usher in a new era of everything being more connected. Its arrival will transform tech as we know it, and the city we live in will become smarter. Think augmented reality, virtual reality, improved streaming resolutions, holographic displays, enhanced power and next-gen cloud computing – 5G is going to be a significant jump forward. All the internet-connected devices in our life will be able to talk to each other at lightning-fast speeds with reduced latency, so we’ll see plenty of completely new gadgets and devices getting online too. What’s really exciting is all the new services that will be built that we can’t foresee. (Think self-driving cars and new modes of transport!) It’s clear that development is going to be huge for connectivity and IoT, and MWC has confirmed that 2019 will be the year of 5G. It’s no secret that consumers are becoming increasingly unimpressed with the frequency and diversity of new smartphone models, with smartphone sales slowing in recent years as a result. Incremental changes to devices year on year and the general lack of new innovation are failing to entice new buyers to the market, where a slightly improved camera and a minor change to the hardware is no longer enough for potential purchasers to reach into their pocket. Consumers are waiting for the next game-changing features, but this year at MWC, it was clear that manufacturers are listening. 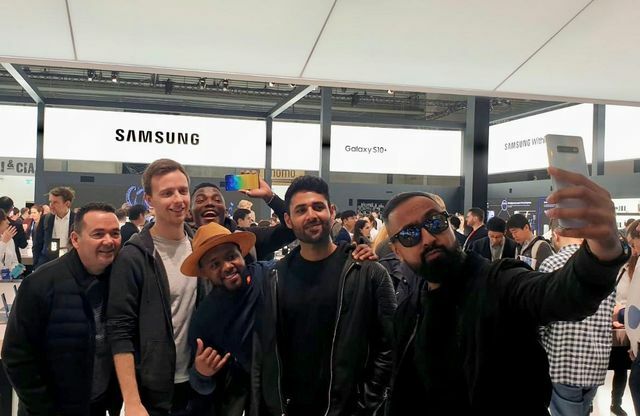 For example, Samsung, one of our clients, was among the first tech giants to announce a new era of the smartphone with the Galaxy Fold, a smartphone and tablet folded into one. This innovative announcement has acted as a catalyst for other smartphone manufacturers to join the conversation. Whilst the concept is still in its infancy, it just goes to show that smartphone innovation is not dead, and that the industry is always looking to the next generation of revolution. We can expect that it won’t stop at foldable phones, and manufacturers will continue to drive innovation through new and ground-breaking products. We could see foldable or rolling TVs, stretchable screens and perhaps a tablet and stylus becoming the norm for pen and paper. It sounds unbelievable right now, but we’re only at the very beginning of our flexible future. Consumers are waiting for the next game-changing features, but this year at MWC, it’s clear that manufacturers are listening.